The other day was Earth Day, and I published a guest-post at On This Deity about it. After romantically fantasising about violent death, I find I get a bit peckish. 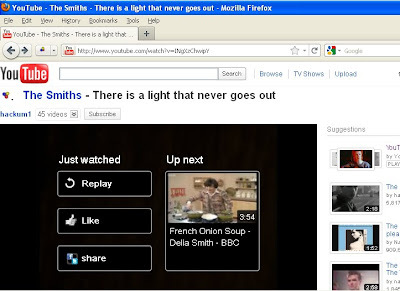 So thankyou Youtube for suggesting I follow listening to the Smiths' There Is A Light That Never Goes Out with a Delia recipe for french onion soup. It's the second day of the inquest into the death of Ian Tomlinson at the G20 protests. The officer who assualted him, Simon Harwood, has been giving evidence, logged on the Guardian's blog. He says before he got to Tomlinson he 'collided' with a BBC journalist but then, after the footage is shown, admits he pulled him to the ground. He says he was hit on the head from behind by a missile, then it is pointed out that he had his back to a wall at the time. He say his push on Tomlinson was slight and didn't 'push through', then after the footage is shown he has to admit that he did. Why is he giving such misleading fob-offs when the evidence is plain and he is immediately shown to be lying? Because it's the way cops answer questions, and they usually don't get tackled this closely, normally they get to give their one version and that is accepted as truth. Look at the video of Ian Tomlinson. Look at the casualness of the officer who attacks him. Look how the colleagues are completely unsurprised. Do you think this is the only time that officer behaved like that? Do you think the colleagues didn't do the same thing elsewhere? Even when they do kill, a later haemorrhage is hard to link up with a single assault and, of course, until a couple of years ago those assaults were very unlikely to be caught on video. Harwood is experiencing something new for police, and he has no idea how to respond. Harwood says he 'couldn't recall' if he warned Tomlinson before striking him. Asked if Tomlinson posed a threat, he replied: "Not to me, no," leaving an open implication that he might have posed a threat to others. This was picked up and, pushed further about whether Tomlinson posed a threat to anyone at all, Harwood conceded, "No, I don't believe he did, no." He admitted a breach of duty by not recording any of his uses of force against Tomlinson in his Evidence and Actions Book. And this was only the softly-softly questioning designed to get Harwood's version, before counsel for the Tomlinson family question him. Harwood interrupted Matthew Ryder, counsel for the Tomlinsons, to disagree when they said - as is plain on the footage - that Tomlinson had his back to Harwood. Eight days after the incident, when Harwood had watched the footage dozens of times, he made a statement saying "if this was me, the use of force was necessary, proportionate and reasonable". Counsel point out that he was then (as he is today) using misleading qualifiers. There was no 'if' about it - it was him and he knew it at the time of the statement. After repeated questioning, Harwood concedes that 'possibly, yes' he had known at the time. Ryder: We have all see the video, how you push him and follow through, and we have heard from everyone else who was there as to how they perceived it. You have told us that you didn't perceive Mr Tomlinson to be a threat … If you want to help, would you like simply to admit that what you did to Mr Tomlinson was unreasonable, unnecessary and excessive? Harwood said if the officer using force believes it to be reasonable at the time, then it is reasonable. No other test can or need be applied. Utterly gripping stuff pouring light onto a dark injustice, but we already know the outcome. Not just because experience shows that cops routinely get away with killing the public despite overwhelming evidence, but because the decision not to prosecute Harwood was taken last July. This is all uncomfortable for Harwood but, like so many other killers in uniform, he nothing to fear except embarrassment.